Say what you want, but I seem to be causing shifts. A couple of weeks ago, I wrote that the Bloc was likely to disappear. Just after that, the Bloc was rising again. Then, earlier this week, I did an analysis showing that the Liberals of Justin Trudeau needed to have a significant lead in Ontario in order to really challenge Harper. I was also showing that at this point, this lead wasn't there (something that was confirmed by riding polls) The very same day, we started seeing polls with the Liberal either first or close. In particular, these new polls all show a lead for the Liberals in Ontario. 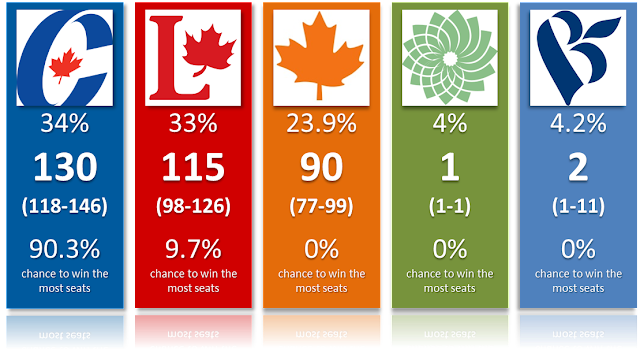 There was Nanos first (+9 pts at some point, although it has slightly decreased to +7 this morning after some fluctuations), Abacus (+7), Forum (+3) and even Ekos now has the Liberals first overall and in Ontario (+7; although the one Ekos added to the poll average is from 2 days ago). There was also a new Leger (+3). And this morning, guess what, we have a new Mainstreet poll. Yes, the same guys who showed the Conservatives almost in majority territory a couple of days ago (by publishing a poll days after having collected the data). And the new poll now shows Conservatives and Liberals neck and neck overall, with the Liberals a full 7 points ahead in Ontario. So either they were wrong back then, or really the Liberals have had a good week (I suspect it's a mix of both). The new projections are below. The Liberals are still second. I added the Nanos of this morning, as I do every 3 days. I'll add Ekos later when published as well. See the details on the permanent page for the federal election. Why are the Liberals still not higher? Well, first of all, the electoral system being what it is, the nationwide numbers are meaningless. You need to look at provincial ones. And there, you see the Liberals killing it in Atlantic, involved in a potential 4-way race in Quebec where they can't expect that many seats from, on the rise in Ontario where it's starting to pay off, up in Manitoba but still third in Saskatchewan (as confirmed by another Mainstreet poll this morning; Those guys are busy), still too far in Alberta to really expect more than 1-2 seats and finally, and this could become significant next week, potentially challenging for first in BC. But as of right now, I still see them slightly lagging in terms of seats. Also, remember that I try to account for the systematic underestimation of incumbents by the polls. Therefore, if polls show CPC and LPC tied overall, my projections will give the Tories a small edge. Yes this is partially subjective and yes I'll live and die on it. At the same time, taking polls purely at face value is not necessarily better. Polls allocate undecided weirdly and again, have a strong tendency to underestimate incumbents (as well as the Conservatives in 2008 and especially in 2011). But you can hate me for these small adjustments. You should know however that I slightly changed them. I used to allocate 50% of undecided to the CPC and 25% to the NDP and Liberals each. I now give more to the Liberals and less to the NDP to reflect the fact the NDP is falling and dropping to third. You should also know that even without my adjustments, I'd still predict the Tories to be favourites. Just slightly less. At the end of the day, if you hate my adjustments, just use the model yourself with your numbers. The NDP is literally collapsing. In Quebec, it seems this party is now in danger of not finishing first. Although, to be fair, Quebec seems pretty unpredictable with polls showing the NDP ahead, others the Liberals and some even have the Tories. The only good news for Thomas Mulcair is that the Bloc seems to have fallen back below 20%. In Ontario, the NDP is now clearly under its result of 2011 and is polled as low as 14% in the new Mainstreet! There are 10 days left to this campaign and I'm not sure there is anything Mulcair can do to bounce back. At this point, they probably need to focus on Quebec and BC to save some seats. And maybe expect that some of the industrial Ontario will react to the TPP. I'm not in the business of predicting what will happen in 10 days. But let's just say the last week should be interesting. If the numbers keep being good for the Liberals, I might have final projections that would be, literally, too close to call (finally! After covering so many elections with final predictions so clear - Alberta 2015, Quebec 2014, Ontario 2014).